With many great parks in Door County you are sure to find great roads wherever you are staying. We’ve provided you with our recommendations for what to do depending on who you’re with and what type of adventure you’re looking for! Our top recommendation for taking your family on a biking adventure is the Sunset Bike Trail in Peninsula State Park. The trail starts from our lot and is a 9.7 mile loop on crushed limestone. The flat to gently rolling trail is perfect for any skill level and offers great rest stops and areas of interest including Weborg Marsh, Eagle Bluff Lighthouse and Nicolet Bay beach. The trail is open to hikers and joggers. Not only does the park offer options for the family but if you are looking for some more adventure jump onto one of the off-road mountain biking trails that cover 12 miles of scenic forestry on the top of the bluff. We have mountain bike rentals for this type of terrain and trail passes are required for cyclists 16 and older which can be purchased at the time of rental or at the park office ($4 daily and $20 annual passes available). When you purchase a trail pass you will be provided with a map of the off-road trails. If you are looking for a quieter and more remote destination, Newport State Park is the perfect place to find your adventure. Newport State Park is located at the tip of the peninsula and provides about 15 miles of off-road terrain. 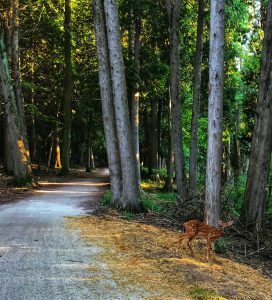 The trails are easy to moderate and give way to beautiful views of Washington Island and Pilot Island on the sandy shores of lake Michigan. The park also offers miles of hiking and snow shoeing trails that traverse the shores of Europe Lake, a hidden gem in Door County! Located south of Jacksonport, Whitefish Dunes State Park and Cave Point County Park combine the best of the Door County shoreline. Cave Point, as it’s name suggests, leads you along rocky cliffs and inlets along the shore. Hike the trails north or take the walking trail south to connect you to the peninsula’s longest stretch of public beach. The sandy shores of WhiteFish Dunes are a great place for the family and the dog! In addition, Main trail on the opposite side of the Dunes leads you to Old Baldy, a beautiful lookout over Lake Michigan and the interior of the Peninsula. Most beautiful in the Fall! You can probably tell by now that we love this park! If you are looking for a nice paved road, the park has plenty of quiet and scenic roads. Check out maps of our favorite bike loops if your looking for a challenge or just a scenic ride. In addition to following the many scenic rest stops also available on the Sunset Bike Trail, riding on the paved roads let’s you venture to Sven’s Bluff, Eagle Tower, Peninsula Golf Course and many of the beautiful interior roads. There are miles and miles of smooth paved road all over the County just waiting to meet your wheels! Below you’ll find Map My Ride links to some of our favorite tours. Whether your looking for a 10 mile scenic loop or a 50 mile tour we’ve done it all and can help you find the adventure that fits you!